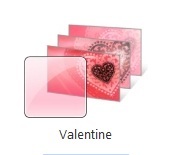 Microsoft has added a valentine theme for Windows 7 in Windows 7 theme gallery. Name of this theme is LacyHearts. Theme looks cool. So, celebrate this valentine with Windows 7 valentine theme. Download Windows 7 Valentine LacyHearts theme.